A trio of disaster relief firms responded to Palm Beach County’s call to clear away debris left last year in Hurricane Irma’s wake. The firms cleaned up — and then they really cleaned up. They were paid a combined $31.7 million for their work collecting debris, hauling it away and mulching it, according to figures from the Solid Waste Authority, which oversees garbage and recycling in unincorporated sections of the county. Phillips and Jordan, based in Knoxville, Tenn., got the lion’s share of that money, $17.8 million. AshBritt, whose owner, Randy Perkins, made an unsuccessful run for Congress in 2016, got $12.7 million. Bergeron Emergency Services got $1.1 million. Some of the firms with existing county contracts to handle garbage and recycling also pitched in and collected extra fees. Now that hurricane season is back, the Solid Waste Authority is again poised to tap contractors should disaster strike. Some county residents were disappointed that debris sat long enough after Irma to brown their lawns and clutter their streets and driveways. But the Solid Waste Authority said debris was removed faster after Irma than it was after hurricanes Frances and Jeanne in 2004 and Hurricane Wilma in 2005. Authority spokesman Willie Puz said it took 87 days in 2004 to make a first pass throughout unincorporated parts of the county collecting debris and six months in all to remove the debris Frances and Jeanne left. The next year, it took 68 days to make a first pass and four and a half months to collect all of the debris left by Wilma, Puz said. Last year, with more staging areas for haulers to work from, haulers made a first pass through the county in 37 days and had all of the debris scooped up in 59 days. Frances and Jeanne, Wilma and Irma all left about 3 million cubic yards of debris, Puz said, adding that the additional staging areas and help from residents made debris removal after Irma go more smoothly. “Residents did a fantastic job of separating material at the curb as we asked,” he said. 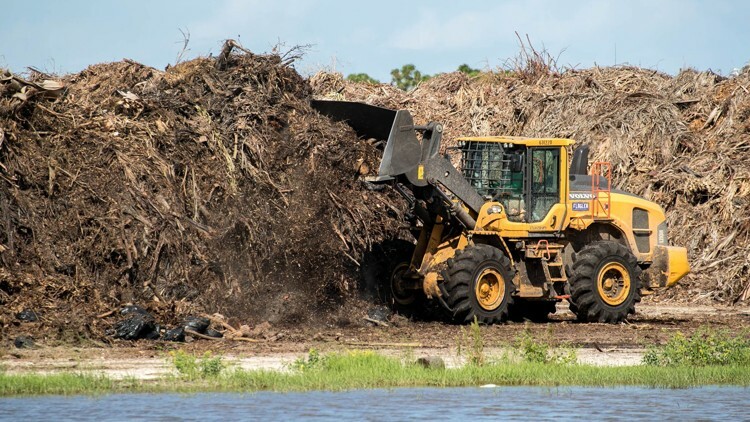 Palm Beach County was spared the problems officials faced in other areas across Florida,where debris removal firms insisted on higher-than-contracted fees before clearing away the storm-generated mess. Bondi’s office issued investigative subpoenas to the firms, AshBritt, DRC Emergency Services and Ceres Environmental Services. “We are still reviewing the information produced in response to our subpoenas under our investigation of debris removal services, but we do not have separate investigations of Ceres and DRC,” said Kylie Mason, press secretary for the attorney general’s office. AshBritt officials said the company continues talking with Bondi’s office and is “confident that we will able to successfully satisfy all their questions and help make Florida better prepared” for the 2018 hurricane season that began Friday. Perkins ran for Congress in 2016 as a Democrat. He was defeated by Brian Mast after a campaign during which he defended his company’s work. Puz said AshBritt, Bergeron and Phillips and Jordan remain among the firms the Solid Waste Authority has contracts with to remove debris in the aftermath of a storm. In addition to AshBritt, Bergeron and Phillips and Jordan, the authority has debris removal contracts with Ceres, DRC and CrowderGulf Joint Venture. All of the contracts run through May 7, 2022. The Solid Waste Authority was so pleased with the work of Bergeron that John Archambo, director of customer relations for the authority, wrote a testimonial for the firm.